What are the biggest problems when it comes to school districts and their surveillance systems? School districts are often reluctant to release security system maintenance records so unless you are the one doing maintenance, it is hard to find out. However, maintenance logs recently released by two Colorado school districts provide a glimpse into the every day problems of school surveillance systems. Two school districts were willing to provide information -- Pueblo School District 70, which has 32 cameras (maintenance logs) and Pueblo School District 60 which has not publicly released the number of cameras it has (maintenance logs), in response to KOAA, a local news station, who requested maintenance logs for surveillance systems from seven different school districts. The records show 44 maintenance requests from 2010-2013 for District 70, or about 14 per year (for 32 total cameras). District 60's records show more than 110 maintenance requests since 2010. Most of the maintenance requests are for regular relocating or repositioning cameras. However, the records show that vandalism was a main problem for its high schools. There were almost ten incidents that could have been related to vandalism/mischief. Cameras were pulled down, brackets broken, or cameras were found hanging by the cables. At one middle school a camera was repositioned to face the sky. At an elementary school, a camera cover was found on the ground. 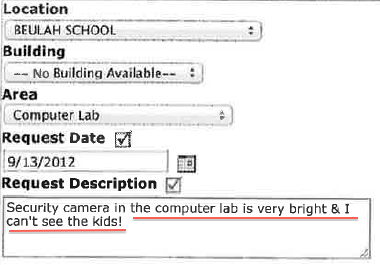 Some excerpts from the maintenance logs include all of the cameras failing to turn on after a power outage at one elementary school and a DVR fan that stopped working, leading the school to shut down the device "to keep it from burning up." 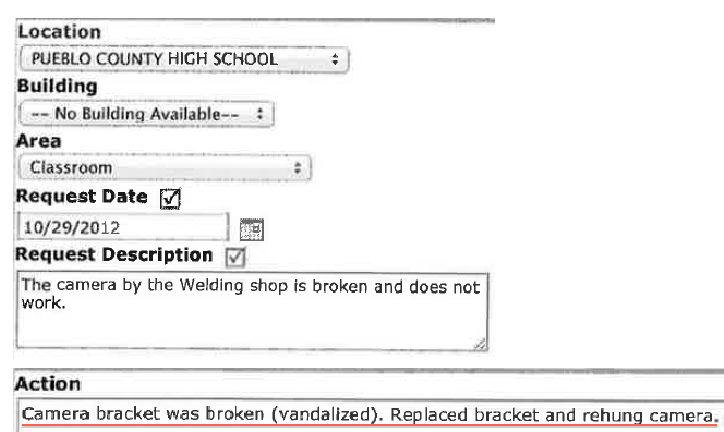 General mischief by the welding shop class. "I can't see the kids!" The logs also show that most of the repairs were completed within days or weeks. In 2010 there was a point where 14 of 20 cameras were broken for almost three months, but after that repair there was never more than three cameras out at a time. For that request, three cameras had to be replaced, three were repaired and the rest of the problem was attributed to "1 bad coax connection port." Another common problem was only described in maintenance logs as "cameras not working." In these cases cameras would go out with no explanation and instead of providing an a reason why, the tickets were closed out after the repairs with notes like "Repaired camera. Working now." It's great that districts are keeping records, but they could provide more value if they were keeping better details on what the exact problems were. When the tickets are closed out, there should be an explanation telling either why the camera was not working or what component was repaired or replaced, especially in cases where multiple cameras or cameras in critical locations went down. This information would be helpful to keep an eye on trends and useful as a reference in the even anyone other than the current service provider has to do work on the system.